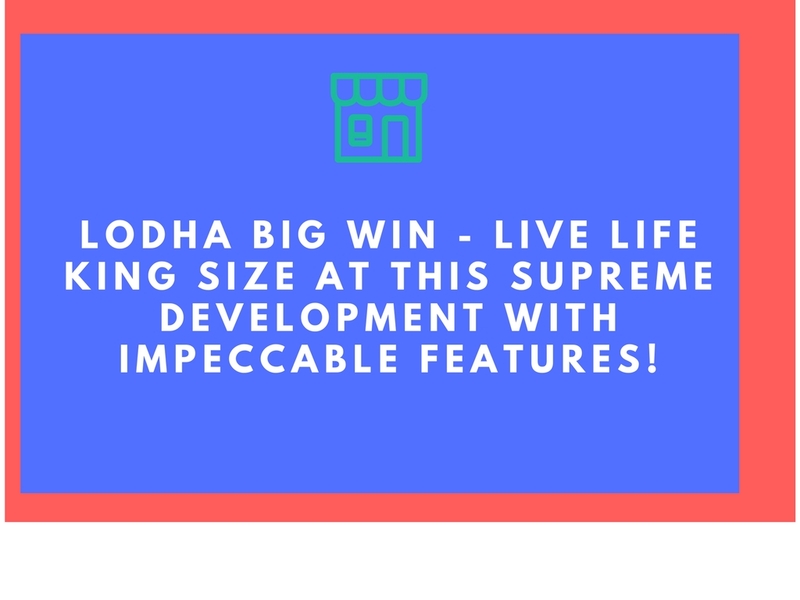 Live life king size at this supreme development with impeccable features! Mumbai is a beautiful city that is also the economic capital of the country today. There is so much to this city other than what meets the eye! The real estate market in Mumbai is thriving with numerous residential as well as commercial projects in different parts of the City. Lodha Codename Big Win is a unique residential project in Mumbai by Lodha Group that offers world-class luxury and comfort along with a beautiful tough of nature for a well-balanced lifestyle. Spread over a land of 5 acres, this residential development contains of 6 grand towers (G +22) that offer blissful variants of 2BHK and 3BHK luxury apartments that are designed to please. The apartment carpet areas startat 631 sq. ft. and go up to 1289 sq. ft., offering plenty of luxury space to meet all your needs and necessities. Lodha Big Win is a marvellous development that offers premium luxury and comfort for a splendid life in Mumbai City. You will find apartments that are high on space and provide ample natural lighting, air-flow in every room and contain lavish fittings & fixtures, splendid flooring, elegant kitchens, decorative doors, large balconies and beautiful windows, multiple safety features, modern electrical ports switches, and so much more. This development also offers fabulous external amenities that will take your breath away! With something for you and every member of your family, experience a life of fun and excitement each day when residing at this development. The external amenities include a swimming pool, well-equipped gymnasium, multipurpose hall, hammocks, picnic areas, tree-top walkways, fancy sit-outs to spend time with your loved ones, café, fabulous landscape garden, Ganesh temple, fast lifts, grand entrance lobbies and tough security with video surveillance in common areas. While this development is designed by Hafeez Contractor and landscaped by Sitetectonix, Singapore, experience a modern-day lifestyle that is nothing short of BIG! Situated at Jogeshwari in Mumbai, this development has a number of landmarks in its vicinity and offers a life of convenience that will always keep you at peace! With places like schools, colleges, banks, hospitals, medical centres, markets, malls, shopping centres, restaurants, cafes, clubs, pubs, resto-bars, cinemas, ATMs, etc. being minutes away, you can say ‘goodbye’ to long distance journeys and welcome a new world of convenience with arms wide open. The strategic location of this development also offers fast and easy connectivity to other locations in Mumbai. Lodha Group is known to offer development that are high on luxury, but low on cost and this development is no exception! Starting at an unbelievable price of Rs.1.64 Cr. and gradually moving up to Rs.3.39 Cr., the apartments at this residential development are affordable and worth every penny spent. You can now own a luxury apartment in Mumbai without worrying about a load on your wallet. There are a number of payment plans that you can choose from along with home loan facilities, NRI services and more for a systematic purchase. Book your apartment today and experience the grand side of life!